Your customer service is outstanding and we have been so well taken care I just wanted to say thank you! Plus we love our ReboundAir. We use it daily and have felt a significant boost to our health. Faster recovery from workouts or injuries, staying healthy throughout flu season..again and weight has dropped a bit. Plus we both sleep better and more deeply. 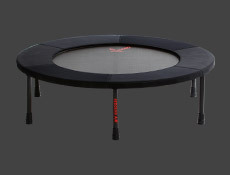 Cannot say enough good things about the rebounder and your company. Hi Darren, I’m another HUGE fan (get it?) 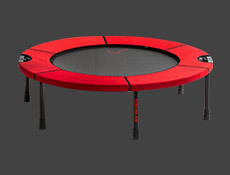 of Biggest Loser and started doing workouts with your mini-trampoline after watching it on the show. It’s such a fun way to exercise and with the right moves can be such an effective workout. I’m a previous owner and facebook fan. I recently gave it to a friend [Quarter Fold ReboundAIR], and am now ordering a new one. Love it!!! I started rebounding 28 days ago. My immune system was so shot and I was tired of being tired and sick. I started with the gentle “health bounce” for 15 min in the morning and 15 min in the evening. I also began a sensible diet to help cut down food allergies etc. My main objective is to get my lymphatic system moving and find some type of exercise I could do without re-injuring my knee (I had the ACL replaced back in 93 and I tore the cartilage off the bone, so no more running or much of anything without severe pain and bleeding in the joint!) so, needless to say, I have been desperate to find an exercise I could do that wouldn’t irritate the bones in my knee. Thanks for a great product and for a great video! Rebounding can provide a scientifically sound workout for cardiovascular improvement and weight management. …she [nurse practioner] couldn’t believe my age. She said, ‘you have the bones of a 17 year old!’ The reading was done with a Sahara Clinical Bone Sonometer and measured a T-score of 2.8. Pretty amazing for someone my age. I’m sure that this test was a result of my exercise on a rebounder, my eating habits and good mental health. Thank you Al for all your research and dedication to this form of exercise. It works wonders if you work at it. What is my primary objective? Weight loss, tone, and a change in my exercise routine. It’s a fun way to make sure I get some aerobic exercise every day. …I also like the idea of being able to get a good aerobic workout indoors without going to the gym. I have a treadmill but it’s so boring! Right now I rebound three days a week, will work up to five or six. 20 minutes at a time, again, I will work my way up to a longer period of time. My objective is to lose weight and tone. I used my rebounder about 13 years ago to lose 40 pounds, therefore, I know it works (along with dieting). I have a free gym membership through my work, but I choose to use this method of exercise instead because I can use it in the privacy of my own home and it’s fun. My name is Ray Koncsol. I’m a 62 year old gentleman that was diagnosed as having Muscular Dystrophy in 1976 in Pittsburgh, Pa. In 1981 I retired in Florida and weighed about 225 lbs. In 1983 I bought the book “The Miracles of Rebounding” and my first rebounder. I have kept your book at my bedside for many years and have read it so much that I have had to use tape to keep it bound together. Thanks a Million ! ! ! Thank you for our pleasant conversation yesterday. I just wanted to take a moment to reiterate some of the reasons I’m truly enjoying the rebounder your company makes. It’s the first type of exercise that I’ve been able to consistently use every day as part of my overall health routine. Since beginning, I’ve noticed improved stamina, overall strength, balance, flexibility, decreased stress, and better sleep – all without stress on my joints. I have even knocked several strokes off my golf game! p.s.- thank you for sending me the tape and book, as my wife plans to take hers with her when she travels. 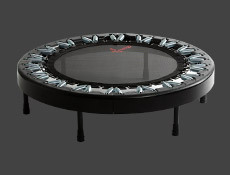 I’m greatly enjoying my ReboundAIR and the $400.00 I saved by not buying a treadmill. I’m losing fat by the handfulls, feeling terrific and having a blast with my rebounder. Of course I’m following a diet too….The thing that first struck me when I pulled it out of the box is the quality of it. The workmanship is top notch. I would like to add that a feature I didn’t notice your website mention is the fact that no assembly is required. Just unfold and you’re ready to jump to it. Again, thank you for your high quality product and the free gifts. …at the club we use all 12 ReboundAirs on a regular basis… it will be nine months now… only replaced one spring… the rebounders still look new. I always look in and notice how much fun the class is having! I Have been using the cheap WAL-MART trampoline, not knowing that so much research and improved rebounders were available. I recently house-sat for a friend for a month and used her ReboundAIR. The difference sold me! I just wanted to write to you to tell you how wonderful for and essential to the therapy and daily life of my son with autism spectrum your ReboundAIR is. Our son is 5’11’ at age 15 and about 150 lbs. He is extremely athletic and runs like the wind. This is his extraordinary gift. But ironically, with the autism, he runs out the door and down the street. With the ReboundAIR he is able to get his exercise without putting his life at the risk of getting hit by a car or being lost. He adores your rebounder and uses it at least an hour a day. He will intermittently get on the reboundair and jump from 3 to 5 minutes. He is very adept at using the Rebounder and would be utterly lost without it. I’ve been rebounding for some time now. My initial motivation was lymphatic health. I have found that I can rebound every day (week days) without any signs of over-training. I have tried running on that schedule but developed ankle and knee pain, so I feel rebounding is better for that style of training. I use a 15 minute rebound session to warm up for yoga and weight lifting. That roll of stretched skin that appears on a woman’s tummy after having a baby, (I have had three) can disappear, and with commitment to your rebounder, DOES. It combats depression, stops menstrual cramps, increases circulation in your face and thus decreases wrinkling and gives you the appearance of youth. My name is Meg knoll and I live in Wisconsin. I’m writing to thank you so much for getting rebounding out where people can see it and realize how great it is! I was someone that was told by my doctor that I needed to stop compression exercise, because of my back. I had been a jogger and an aerobic exercise person for many years. I didn’t know what to do! Walking just didn’t do it for me! …All I can say is THANK YOU! I absolutely love rebounding and it is just marvelous exercise! 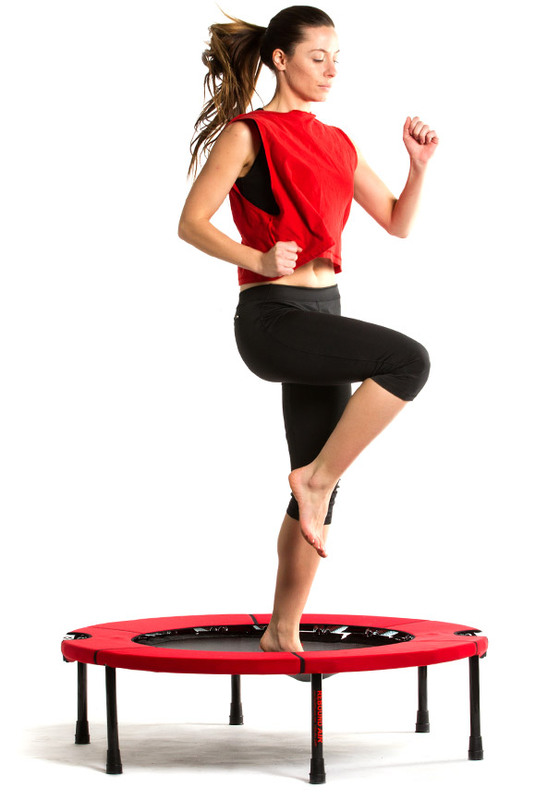 I’ve had no problems with my messed up back and neck – if anything, rebounding has strengthened my back. I just wanted you to know what it’s done for me and that your website is an excellent source of information. I’ve talked up rebounding with anyone that will listen and sent many people to your website. I am rebounding five days a week, but only for two ten minute periods a day. I’m still new at this. My objectives are tone and lymphatic system stimulation at age 49. Rebounding is enjoyable and the time passes quickly. I feel strengthening and toning in the backs of my legs, around my knees and across my back. I need to start increasing the duration this weekend.